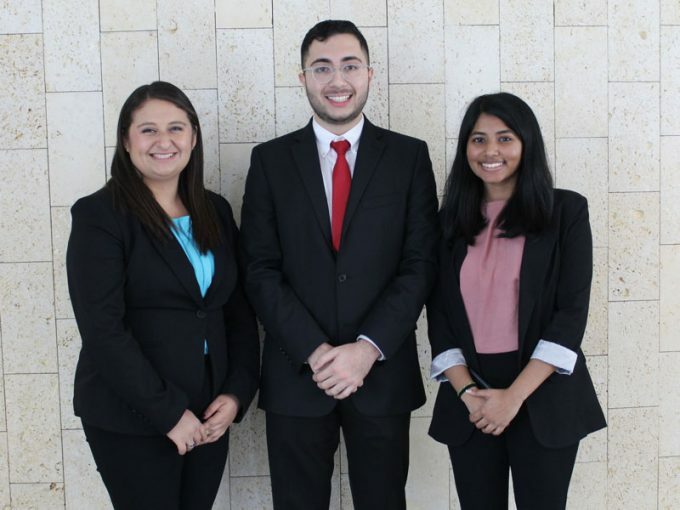 Bauer undergraduates Crystal Gamboa, Nima Nayeri and Sharan Sabu participated in The Honors College Houston Early Research Experience program, addressing a sustainable solution for the Houston area. Undergraduate students from the C. T. Bauer College of Business had the opportunity this year to work alongside faculty to conduct academic research during the Houston Early Research Experience (HERE) Program, sponsored by The UH Honors College. This year marks Bauer College’s first time participating in HERE, a two-week workshop in May designed to give rising sophomore and junior students a closer look at the fundamentals of conducting research, with seminars led by UH faculty and instructors. HERE students earn a $1,000 scholarship and an invitation to join the Houston Scholars program in the fall semester. Supply chain management sophomore Crystal Gamboa, accounting and finance junior Nima Nayeri and management information systems sophomore Sharan Sabu represented Bauer at HERE, working together to address a sustainable solution to contribute to a carbon-neutral region in a 21st century city. During their preparation, Bauer Decision & Information Sciences Instructional Assistant Professor Emese Felvegi, who served as their mentor, guided them to be more effective and clear in their delivery. As a culmination to the HERE program, the Bauer group was invited to the Grand Challenges Forum (GCF). The forum, which partners with the University of Houston Alumni Association and Bauer College, allows students to present their research findings to a panel, and also have the opportunity to hear from scholars, authors and activists.